It's raining. Again. No surprise there for the depths of an Auckland winter! It was beautiful first thing this morning though, so I grabbed my camera, the bag and the cushion and headed down to the beach. I've finished the cushion as you can see. This is the second item for the Corban Estate summer school I'll be teaching at in February 2011. 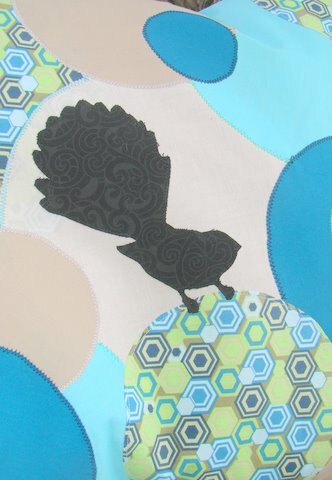 You can just about see the two tone black fabric I used for the fantail applique. It really adds a lovely depth. The beach is just around the corner from our house but I haven't been down there in ages. I think a family trip there this weekend is order! Hope you have a great weekend. Gosh, awesome work on the cushion. 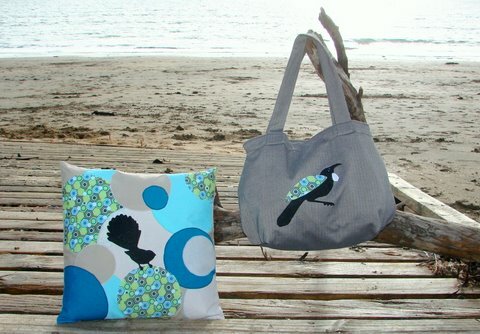 Hope its not too cold for you to enjoy the beach on the weekend. ghah!! you have no idea how much in love with these I am...that cushion would go fabulously in my lounge. too freakin clever! That cushion is fabulous! Great photo, too. What a great effect with the circles, and I love the colours, gorgeous! 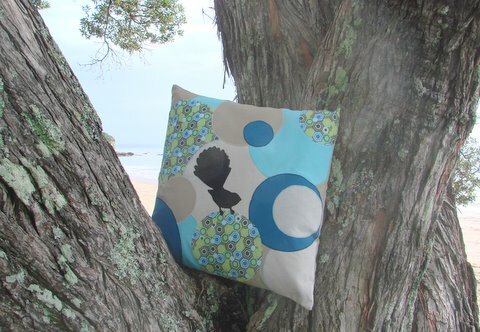 Your cushion is gorgeous & what a stunning setting! gasp LOVE the cushion...seriously are you putting some up for sale on felt? Its my birthday soon and I've been asked what I want. I want that!!! wow, lovely. The bird really finishes off the design. I know what you mean, we live 5 minutes from the beach too, but it has just been too cold lately to go. Oh my goodness, my favourite colours and a Fantail all together on the one cushion! I Love it!